We are finally getting married! We are so excited to share our special day with you all and want to thank you all for showing us such great love and support throughout our lives! Thanks for visiting our honeymoon registry and making this all possible! We love you! 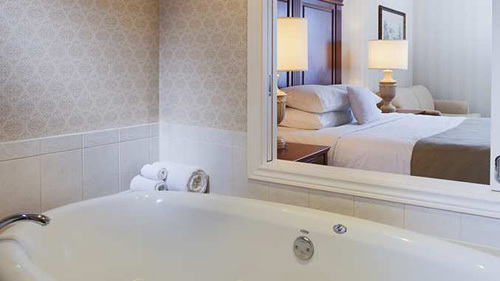 This spacious deluxe king whirlpool guest room is located on the top floor, offering a premium view of the American Falls, Niagara Falls State Park and Niagara Falls, NY cityscape. This room features a king size Sweet Dreams bed by DoubleTree, a plush-top mattress, down blanket and four jumbo size bed pillows to guarantee a great night’s rest. Standard amenities include a two person whirlpool, a separate bathroom ensuite with small shower, a sofa bed, luxurious bath and body amenities, 37-inch flat-screen television, complimentary WiFi access, work/dining desk with seating for two, and mini fridge. The open window component allows a fresh natural airflow into the spacious room. We cannot wait to look out our window at the clear view of the beautiful scenery on our honeymoon. 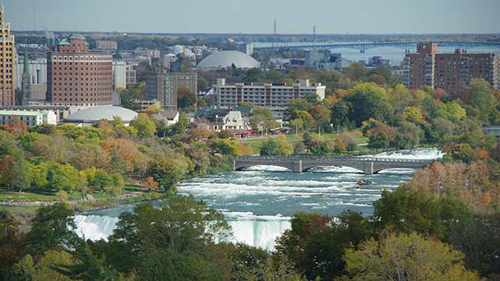 This junior presidential suite is a two-room suite with a panoramic view of the Upper Niagara River, and the cityscape lights of the Clifton Hill/Fallsview Boulevard Areas including the Niagara SkyWheel, Rainbow Bridge visible in the short distance. The spacious private bedroom features one king bed, a Sweet Dreams by DoubleTree sleep experience bed, and a window allowing fresh air access. A separate living room includes a double sofa bed, a second 37-inch flat-screen television and a mini-fridge. There will be complimentary WiFi, a work desk and luxurious bath and body amenities that will keep us feeling pampered throughout our stay. In our junior presidential suite, we will enjoy a two-room suite with a premium view of the American Falls, and the cityscape lights of the Clifton Hill/Fallsview Boulevard Areas including Niagara SkyWheel, Rainbow Bridge visible in the short distance. The spacious bedroom features one king bed, a Sweet Dreams by DoubleTree sleep experience bed, a 37-inch TV, and a window allowing fresh air into the room. The separate living room includes a double sofa bed, a second 37-inch flat-screen television and a mini-fridge. There is also complimentary WiFi, a work desk and luxurious bath and body amenities that will leave us feeling pampered and fresh. 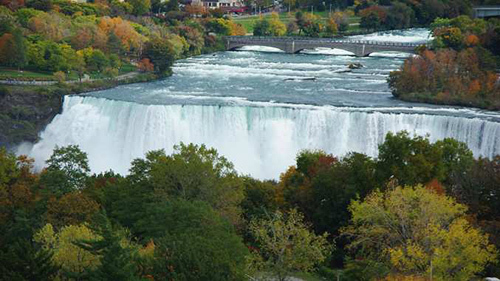 We can’t wait to admire the view of the breathtaking Falls! In room dining is perfect for early mornings, a romantic dinner for two, nighttime munchies, or maybe even a bottle of wine if we decide to have a romantic night in. We will relax and enjoy our delicious cuisine in the comfort of our spacious and relaxing rooms. The In-Room Dining menu features a variety of delicious dishes for us to choose from. With one quick phone call, there will be dining staff ready to take our order! Buchanans offers a spectacular buffet breakfast, an a la carte lunch and an exquisite dinner menu. 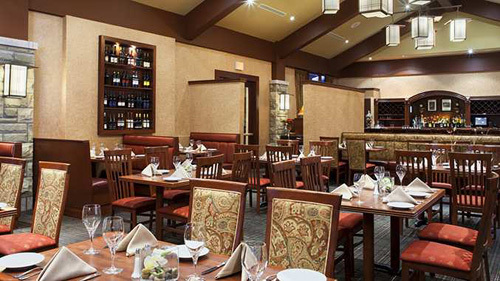 We will enjoy the intimacy of dining in the comfort and warmth of a Grand Lodge setting. 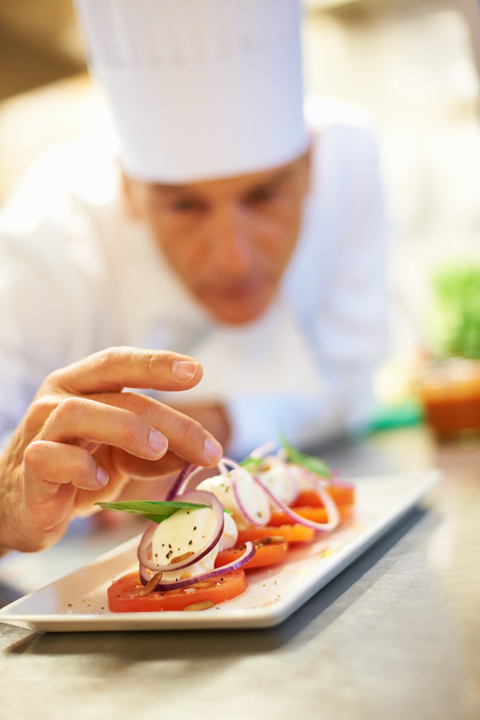 Skillfully prepared seasonal inspirations with premium ingredients, the menu offers an appealing selection of hand-cut steaks, rack of lamb, seafood, chicken, pasta, and salads. We will also taste local award winning wines as well international wines while we enjoy live dinner music, jazz guitar or pianist (select Friday or Saturday). Thanks to your wonderful wedding gift, we will experience extra indulgence on our romantic honeymoon at DoubleTree Fallsview Resort & Spa! We will thoroughly enjoy our time while we indulge ourselves in tantalizing cuisine, enjoy a soothing spa treatment at Five Lakes Spa, or toast to our new lives together with a bottle of champagne in our room as e gaze out at the majestic views of Niagara Falls. After a long day of exploring our surroundings, we can relax at Buchanans as we savor delicious steaks or seafood and taste local wines. This resort credit will truly enhance our intimate escape surrounded by majestic views. Located in one of the most famous cities in the world, Niagara Falls, DoubleTree Fallsview Resort & Spa Hilton Niagara Falls promises us a romantic honeymoon getaway! Also known as the “Honeymoon Capital of the World,” we can breathe in the crisp cool air as we visit the natural wonders of the world around us. With your thoughtful gift, we will enjoy countless activities outdoors, take comfort in luxurious accommodations, dine in a cozy setting and enjoy a round of drinks, or we will discover a world of peace as we experience breakthrough botanical formulas that will deliver powerful therapeutic benefits in the spa. We will luxuriate in an array of lavish amenities at the beautifully designed DoubleTree Fallsview Resort & Spa Hilton Niagara Falls. A chilled bottle of champagne will be delivered to our suite. We will make a toast to our romantic honeymoon while taking in the sweeping views of the one-of-a-kind waterfalls. How romantic! A bottle of a local Niagara Region VQA wine from a celebrated winery delivered to our room or suite. We will make a toast to our honeymoon while taking in the enchanted views of the Falls. We will discover romance at its best! 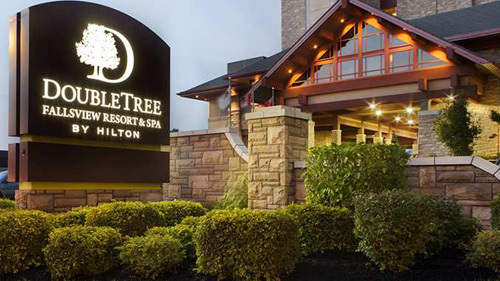 At DoubleTree Fallsview Resort & Spa Hilton Niagara Falls, we can have the romantic wedding we have always dreamed of while being surrounded by waterfalls. The Grand Lodge ambience of Niagara Fall’s exclusive DoubleTree Fallsview Resort provides the perfect backdrop for our special day. This intimate setting seats up to 250 guests, allowing us to be pampered by personalized service that only a boutique hotel can deliver. There will be varied selection of hors d’oeuvres, entrees and desserts tastefully prepared, and artfully presented. We can’t wait to be surrounded by rushing water as we exchange our vows to one another.